In 1967 Isamu Noguchi noted that: At times I am deluded into thinking that the meaning of sculptures may be defined. For his first solo exhibition at Gimpel Fils, Steven Gontarski has created a body of abstract sculptural works that explore the possibility of presenting the human form in non-figurative terms; As a consequence, his work raises questions rather than produce fixed answers. Inspired by the writings of Isamu Noguchi, Henry Moore and others, his new work poses questions about the spatial values of sculpture, its materiality, and the relationship between the solid and the void. Having always considered the varying degrees of abstraction as central to his sculptural practice, the works in this exhibition reflect Gontarski's desire to create sculptural objects that are familiar in their organic form, but which are unfamiliar in the ways in which they are distinct from anything in the natural world. Seen in the context of his recent fibreglass figurative sculpture, the new works combine Gontarski's interest in the body, blood systems and organic abstraction, and demonstrate his continuing exploration of portrait form. Made in plaster, the abstracted shapes appear to contain traces of the body's artery system, so that the circular arcs and curves not only represent life-giving systems, but also are themselves living. However, this apparently coherent sculptural project is problematised through Gontarski's use of armatures and the incorporation of support structures within the finished work. By structuring his rounded, smooth plaster shapes with metal rods, and therefore showing the sculpture's construction mechanisms Gontarski challenges our notion of finality: to what extent do we embrace incompleteness as a sculptural value? Steven Gontarski is fascinated with the way classical sculpture is often exhibited with missing limbs or other broken details. The fragmentation of classical sculpture has itself been incorporated into how we understand it. Gontarski's collection of smooth white, and black, sculptures are not only fragmented, but are also fragments; looking at one informs how we approach another. Alongside the works in plaster, Gontarski will also exhibit two new glass works that recall bubbles, or blood cells. Like Noguchi, Steven Gontarski has entered a 'totally sensuous realm of tactile values' so that smooth and rough, light and heavy, fleeting and permanent create an interplay that challenges the notion of permanent sculptural form. Steven Gontarski was born in Philadelphia and studied BA Architectural Studies/Visual Art at Brown University, Rhode Island and MA Fine Art, at Goldsmiths College, London. He has held solo exhibitions at pkm gallery, Seoul, and Changing Role, Naples, both 2006, at Groninger Museum, Groningen, in 2005, and Le Consortium, Dijon, 2003. Recent group exhibitions include Elastic Taboos at Kusthalle Wein, 2007; Material World, Glasgow Gallery of Modern Art and Sixty Years of Sculpture in the Arts Council Collection, Longside Gallery, 2006. His work was included in the seminal 'Die Young, Stay Pretty' exhibition at the ICA in 1998. 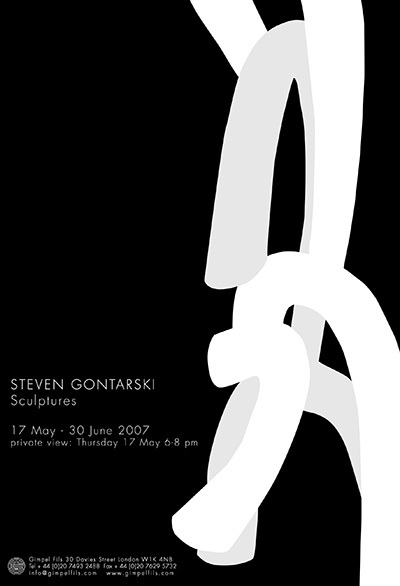 Works by Steven Gontarski can be found in The British Museum, Saatchi Gallery, Denver Art Museum and the British Arts Council collection. David Miles creates intricate narratives of contemporary life through the medium of paper mobiles. Macabre scenes fill the gallery space Downstairs at Gimpel Fils, mixing aesthetic delight with ghoulish and chilling imagery. Working with paper, Miles can be positioned within a long tradition of art history. Matisse's example of drawing with scissors is a touch point for his interest in pure colour and the use of shape and outline to produce a visual narrative. The precision that these works demand for their creation is incredible. Made by hand, Miles has to work carefully to ensure that they are not destroyed by a slip of the knife. But he also utilises the enchantment conjured by hanging mobiles, so that the medium and their fragility belies their unsettling subject matter. The fragility of these works is such that as viewers we expect the scenes depicted in them to be similarly delicate. And in a sense they are; they depict human vulnerability and hopelessness but in quite a brutal way. Pact, 2004, for example includes two falling figures and the outline of a tower block, illustrating a double suicide. Miles takes his sources from local newspapers and personal stories, so that while his works reflect the precariousness of the world, they also contain an element of the documentary. It is this realism that makes his installations unnerving. David Miles' mobiles are also more than their material form. The shadows they cast are integral to the experience of viewing his work. Walking within and between the mobiles and their shadows, audiences become part of the story. The motion of the component parts of each mobile suggest a story that is changing and negotiable, providing fleeting glimpses rather then concrete narratives. Many of the mobiles evoke the spirit of film noir, as shadows of gunmen, car chases and pools of blood are cast on the gallery walls. Baby mobiles are used to pacify and calm, but Miles reminds us of the darker side of these childhood objects: That which exists in the shadows becomes a site of fear. This is David Miles first solo exhibition in London. Since completing his studies at Falmouth School of Art, Cornwall, and Rijksakademie Van Beeldende Kunsten, Amsterdam, he has exhibited consistently including solo shows at Ellen de Bruijne Projects, Amsterdam, and Laing Solo, Laing Art Gallery, Newcastle, in 2005. Group shows have included 'Papercuts', Bury St Edmunds Art Gallery, and 'Near Distance', Arena Gallery, Liverpool Biennial Independents. He currently has a solo exhibition at The Lowry until June 17th.